Thursday night, the Washington Capitals started the second chapter of their quest for back-to-back Stanley Cups as they hosted the Carolina Hurricanes for Game 1 of their opening round series. 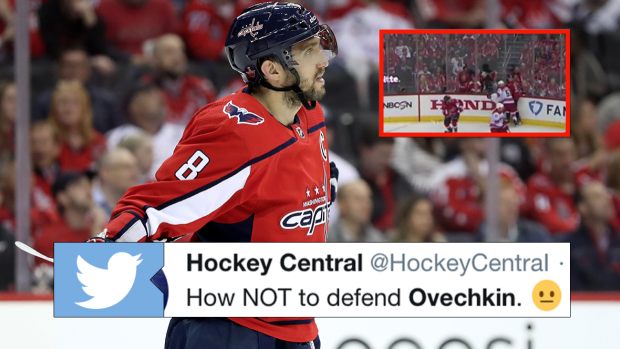 One thing every opposing player should be aware of when facing the Capitals is where Alex Ovechkin is on the ice. Ovi is arguably the greatest goal-scorer in the history of the game and the Hurricanes employed a rather odd strategy for trying to stop him at one point in the game. Literally the boldest of strategies and it didn't take for it not to pay off as Ovi scored on that power play shortly after. His goal was the eventual game-winner and the Caps are up 1-0 heading into Game 2. Nicklas Backstrom joined Alex Ovechkin as just the second @Capitals player to collect at least 100 playoff points.